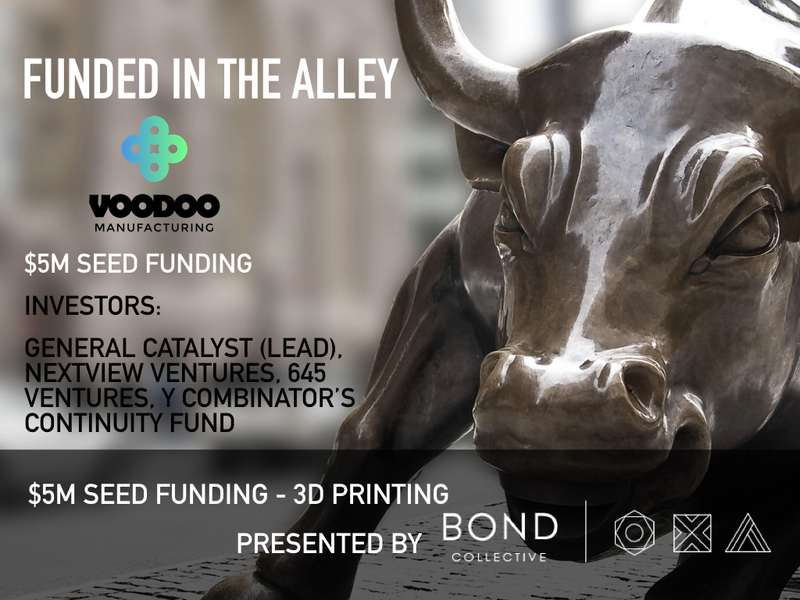 This installment of Funded in the Alley is presented by Bond Collective. Leading the way in hospitality and luxury offices space, Bond Collective designs workspaces to empower individuals and companies to be themselves. Rather than fit you into a limited, traditional office environment, Bond 60 Broad features larger 15-50+ person suites customized around your needs: privacy with access to community, concierge service, views of the Statue of Liberty, sound booths, and designer furnishings, just to name a few. Focus on your dream, and we’ll handle the rest. Whether manufacturing returns to the United States at scale is yet to be determined. However, one thing that is certain is that with the advent of 3D printing and robotics, manufacturing will not be the same. Voodoo Manufacturing is poised to capitalize on this with its software driven 3D printing factory that minimizes costs associated with manufacturing and cuts lead times for mass production. 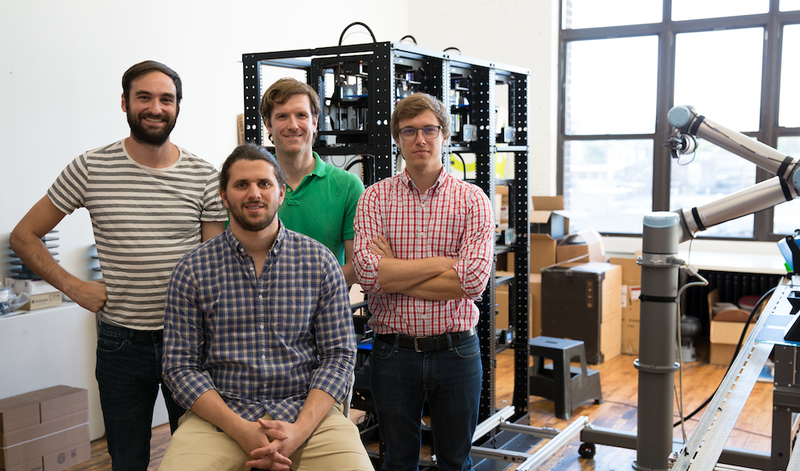 Founded in Brooklyn in 2015 by former MakerBot employees, the startup has raised a total of $6.65M over three rounds and this latest funding is providing the firepower to build the future of automation in manufacturing. Today we sit down with Max Friefeld, cofounder and CEO of Voodoo Manufacturing to discuss the startup, the future of manufacturing, and the company’s latest funding round. We raised a $5M seed extension round led by General Catalyst, with participation from NextView Ventures, 645 Ventures, and Y Combinator’s Continuity Fund. Voodoo Manufacturing is a software-enabled 3D printing factory that works with major brands to produce high-quality products, prototypes and parts at scale. We have manufactured 3D printed parts for major brands like Microsoft, Viacom, Mattel, Intel, Autodesk, and more. At Voodoo, we minimize the cost and lead-time for mass production and customization, making it possible for consumers to have a completed customized product overnight. Compared to traditional manufacturing, 3D printing increases design freedom and serves as a low-cost alternative to traditional manufacturing. The idea for Voodoo started while our team was at Makerbot. They had internal “Bot farms” where they made sample parts and ran select projects for customers. At one point, we realized this could be turned into a larger business and convinced them to let us take it out on our own. We left MakerBot in May 2015, publicly launched in October 2015, and have been growing since. At Voodoo, we use commoditized 3D printing technology to manufacture plastic parts and products. Our unique approach to manufacturing allows us to produce anywhere from 1-10,000 parts in less than 2 weeks at prices that are competitive with injection molding. The fact that we are able to cost-compete with injection molding is what makes us a viable alternative for producing many different types of parts. Until today, 3D printing has remained a technology used primarily for prototyping, but at Voodoo, we’re pushing it in a direction that makes it available for actual end-use part production. We typically get two types of orders – Marketing and advertising (swag, merchandise and promotional products) and Hardware and engineering (prototypes, models, components/parts for kickstarter projects).It has been estimated that between 1-3% of the worldwide $200B injection molding market is for runs of less than 10k units. That would mean our addressable market within injection molding is appx. $2-6B. We produce parts and products for our customers across two main services – Direct Print, a quick turn around low-volume service and Volume Printing, high volume orders (up to 10,000 units in 2 weeks) that may include 3D design and project management components. Would you mind telling us about how you are applying your offering into factory automation? Beyond 3D printing specifically, we believe in a digital future for manufacturing where lead times are short, iteration cycles are fast, products can be customized, and runs can start small and scale instantly. Our goal at Voodoo is to always stay focused on those core goals so we achieve that future. We recently launched Project Skywalker, the first fully functional robot-operated 3D printer cluster. The use of a collaborative robotic arm will enable us to automate labor intensive processes such as plate “harvesting” — the act of removing and replacing a printer’s build plate once a print is completed. We’re automating much of the repetitive labor within the factory as part of a 90% reduction plan. With this disruption of jobs, we now need a wider array of education and building programs to educate our workers. We’re currently working with a few city organizations who help with sourcing workers, but also getting them trained. It’s a really exciting time and we are eager to bring on several new team members to fill these new positions. We’re a startup who believes that robots and AI will help bring manufacturing jobs back to the U.S. It was important for us to take the time and find the right investors who also believe that automation can be a good thing. Not many investors fully understand what’s happening in the manufacturing industry today. Most people are confused by job automation — yes, some jobs will be replaced by robots, but there will be new opportunities. The truth is, we’re never going to see the same manufacturing jobs that we use to have. The fact that we’re building a digital factory to make manufacturing as fast, affordable and scalable as software. Further expand into new verticals like marketing and promotional products. Continue to automate much of the repetitive labor in the factory as part of our 90% reduction plan. Expand operations and double in size, adding key positions (sales, engineers, etc.). Focus on your customers. Take the time to talk with them and get a thorough understanding of their pain points. When we started Voodoo, one of our primary goals was to build a “real” business – one that was profitable from the beginning. We’re proud that we achieved this by our one year mark. Right now we are focused on integrating more robotics, reducing factory costs and expanding our team.